Eastern Standard. Photo by Emily Hagen. 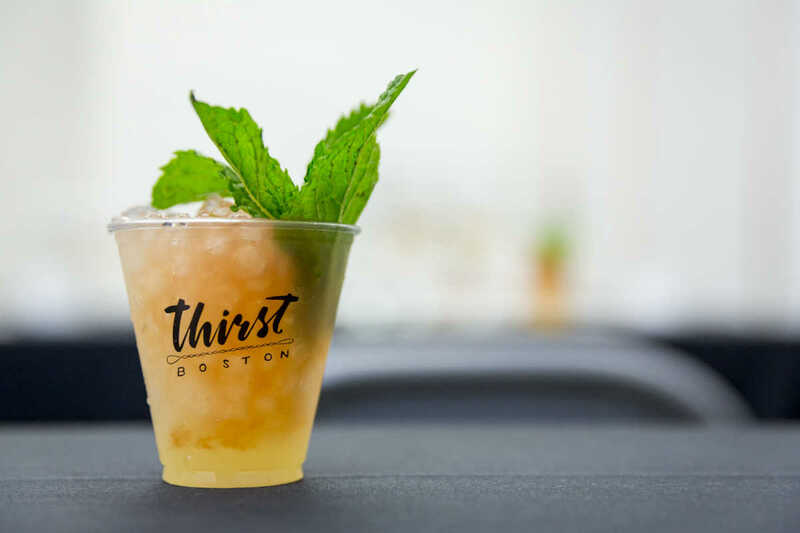 I sat down with Garrett Harker and Jackson Cannon, the respective restaurateur and bartender duo who profoundly changed Boston’s cocktail and hospitality scene with the opening of Eastern Standard in 2005. 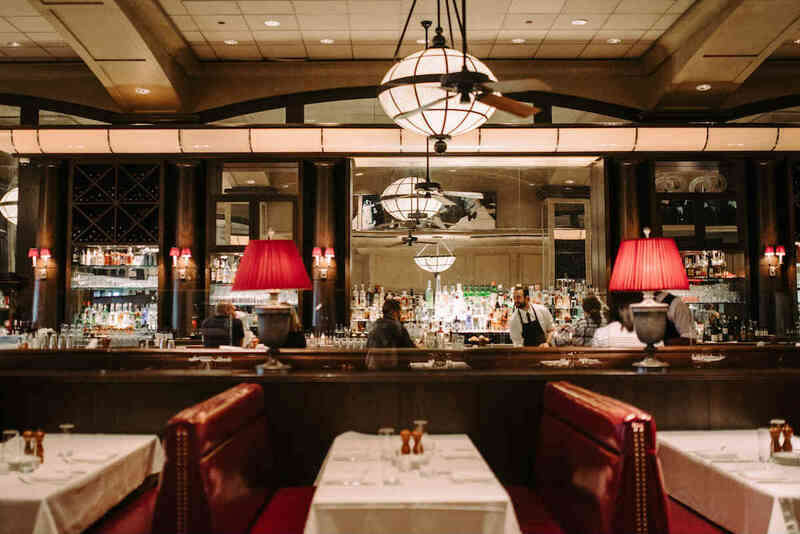 In the years since, Harker’s restaurant group has opened numerous other Boston-area bars and restaurants, including The Hawthorne, Island Creek Oyster Bar, Row 34, and Branch Line. Together the group employs some 650 people, and its alumni have gone on to pollinate the regional and national hospitality scene. Our conversation touched on “competitive empathy,” why everyone should know how to stir a proper Martini, and the ways in which hospitality is changing. What brought the two of you together? Garrett Harker: In February of 2005 I was putting together the team that would open Eastern Standard. I was in the market for a bar manager and I interviewed Jackson for the job. He was recommended by the chef I had landed on, Jamie Bissonnette. Previous to when Garrett tapped you, where had you been working? Jackson Cannon: I’d been in Boston for 15 years or so playing music, doing odd jobs, and running with a crew of musicians, booking agents, and bartenders. I was spending a lot of time in restaurants but hadn’t worked that much as a bartender. I was friends with Pat Sullivan and Brother Cleve through the B-Side Lounge and also ran with Misty Kalkofen—people who were really into cocktails. Who mentored you in your fields? JC: (Pointing to GH) That guy. I didn’t have a mentor for bartending. At that time they didn’t exist. We were all self-taught together. I was kind of a sponge around Garrett. I feel like I soaked up a lot of those necessary lessons and mechanics. GH: But I would say there’s mentor, and then there’s muse. We were really trying to tap into the muse that the B-Side Lounge might be to a 200-seat restaurant. We wanted that sort of edge from the B-Side. As a restaurateur, was there a figure you learned a great deal from? GH: I can point to the guy who hired me into the business back in San Francisco, Pete Sittnick. Pete’s the one who ingrained in me the idea that you stick around for a long time, and you create an environment where the people want to stick around for a long time. Out of that comes development and growth. Garrett Harker. Photo by Kristin Teig. There’s a stereotype that someone is only working behind a bar because they’re auditioning or going to law school. 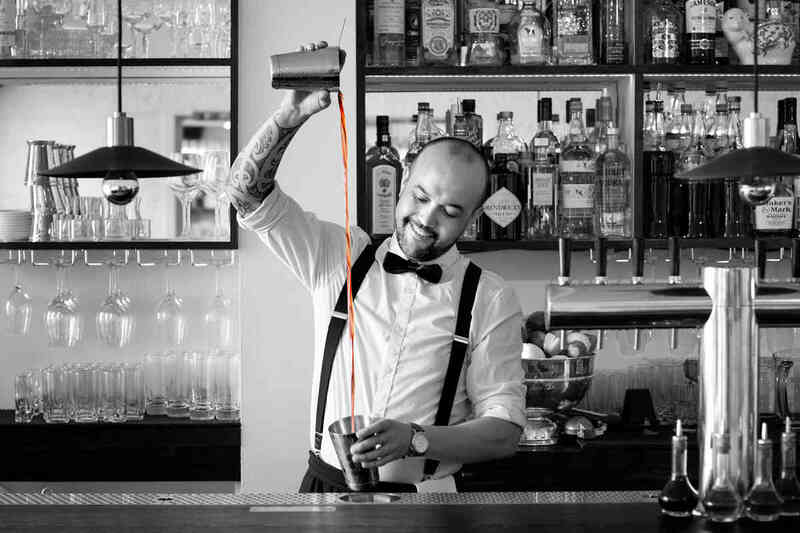 How do you foster bartending as a career rather than just a “job”? GH: To me, craft is a set of acquired skills. If each day you’re striving to better your technique, your understanding of flavors, then you’re creating something you can attach yourself to that is sustainable and endures overtime. What skills are your employees being taught that they might not be taught elsewhere? JC: The ability to digest a large amount of information and pick out small amounts of it that are useful to given situations. They are learning to stir martinis properly, which by the way is harder than shaking a Daiquiri and should be as common a trait among us as knowing how to sear a steak and sew a button. It may seem like a mundane thing, but just because it’s simple doesn’t mean it’s easy. If each day you’re striving to better your technique, your understanding of flavors, then you’re creating something you can attach yourself to that is sustainable and endures overtime. Can you elaborate on empathy and compromise? GH: It’s useful in every context. It’s related on one end to making a great first impression, but on the other end to having sustainable and fulfilling relationships. How to work within a team effectively, how to pick up for those who are a little less skilled or have less experience than you. How are empathy and compromise useful in a customer-facing way? GH: What we’re trying to create in the service experience is trustworthiness. The first quality of trustworthiness is a demonstration of warmth and caring. If you can fit that in with knowledge and appreciation for the craft and technique, then you’re going to create the opportunity for a transcendent service experience. GH: That’s sort of a tenet of our group. What is the restaurant business at the core? It’s competitive empathy. Jackson Cannon. Photo by Melissa Ostrow. What does “competitive empathy” mean to you? Is there a single quality that all of your fresh hires have in common? JC: No. Even if you could, would you start nine pitchers on a baseball diamond? There’s a power in diversity on every level in teams, which kind of belies the idea that there is one golden characteristic that unites them all together. Having said that, there are a string of adjectives we’re looking for: warmth, trustworthiness, team-oriented people. Is there a sense of community among those who have “graduated” from your bars and restaurants and gone elsewhere? JC: I’m in touch with a lot of our top performers on a very consistent basis. I make it clear as early as I can to young people coming into the system that I’m their advocate for their experience here, and wherever they go from here. 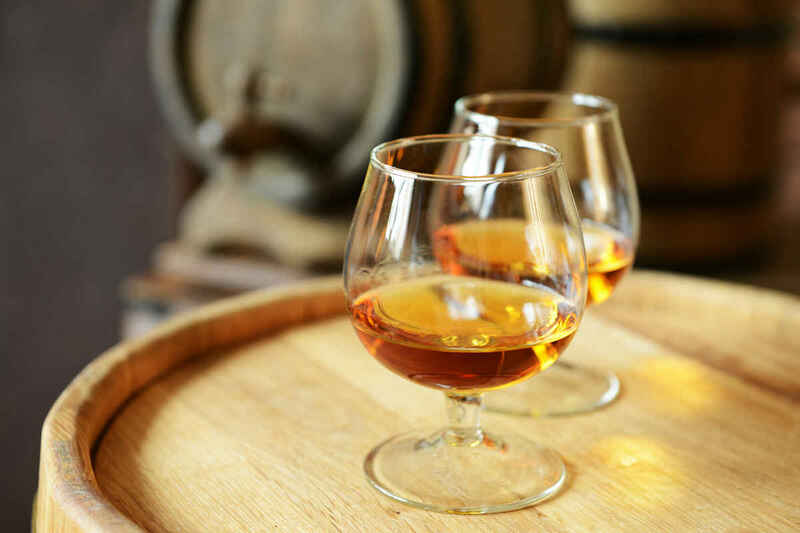 It’s been a really interesting and rewarding experience to help a few of them transition into other areas of the industry working for liquor brands and such. And it’s been the highest kind of fun to see some of them go on and run programs and become entrepreneurs in their own right. We were growing at a rate that allowed some of us to stay and partner in and make our next steps together. That’s kept a certain number of people growing behind us. But there’s a limit to it, and the second that that limit is reached I’m as interested in finding that person a growth opportunity elsewhere. GH: Anytime that we can send someone off who’s going to continue the noble work, I think we’re all proud. JC: There’s a purpose beyond the purpose, and that’s evidenced when you walk into a place and you’re having a great time and you say “Oh, where’d you go to school?” And it turns out it was Eastern Standard. What we’re trying to create in the service experience is trustworthiness. The first quality of trustworthiness is a demonstration of warmth and caring. Can you sense when someone is approaching that limit and ready for the next phase of their career? GH: It’s a little bit of a mystery that you’re always trying to unlock. I think there’s a kind of graph of ambition versus skill set or capacity for leadership, and if one is out in front of the other it’s our job to bring it to light. JC: We’ve had some great success stories of people starting with us—I’m thinking of Jillian Rocco who went from food runner to the top server with a wine focus at a time when there wasn’t a GM job. And there was a GM job in another group, which she took and did marvelously. But when the time was right, she came back to us as a GM and now is an operations manager. GH: Tom Schlesinger-Guidelli came up through the mixology world under Jackson, left us, opened Craigie on Main as the opening bar manager. When he felt like he had done all he could do there, he came back to us and opened Island Creek Oyster Bar as a general manager. Now he’s opening his own restaurant on Lovejoy Wharf, called Alcove. Tom is a shining example of somebody who gave as much as he got, got as much as he gave. JC: It’s an interesting combination. They come back sometimes appreciative of what we do right, and they come back with fresh ideas sometime that help us get better. Who are some of the other alumni that you feel particularly proud of? JC: Jared Sadoian. I hired him as a barback when he was a senior at MIT. He had no restaurant experience. He was graduating with honors in a very obscure sort of software discipline, and he already had a job at a New York bank. I said, “Why do you want to do this dirty job with your Saturday nights for the rest of your senior year?” and he said, “Because I’ve fallen in love with cocktails, and I need to know how this works.” He went to New York and got a job moonlighting at a bar there. Then he came back to Boston and became the next bar manager for Craigie on Main. When he left there, he came back to us and is now the assistant bar director of the group, supporting me across all outlets. He’s based at The Hawthorne. Andrew Holden stayed as the general manager of Eastern Standard for 10 years before he partnered with Garrett to open Branch Line. He’s a partner and still oversees Eastern Standard. Kevin Martin, the director of operations for Privateer Rum, started at Eastern Standard as a bartender and became bar manager there. GH: We started a program years ago where we’d put any hourly person who was interested into the Boston University wine school. Some went through one level and went back to doing good things in the restaurants; others made it a pursuit of theirs. We’ve got some high level wine people who are off in New York doing really cool stuff. We have wine people at Eleven Madison park, The Modern… We have Marley Tomic-Beard in Seattle. Jamie Bissonnette came out of the kitchen. Lauren Moran was our pastry chef company-wide. She now has her own amazing business up in Hamilton, Massachusetts, called Honeycomb. There’s a power in diversity on every level in teams, which kind of belies the idea that there is one golden characteristic that unites them all together. There’s a concern that the talent pool for bars and restaurants is being strained in some cities, and there’s a fear that talent isn’t being replaced quickly enough as more establishments open. Do you find that to be the case in Boston? Is there a way that you see the industry changing in the next five to 10 years, and will that have an effect on the way your staff is being trained? GH: On a micro level, I think the millennial generation doesn’t think linearly about their ascension through the restaurant group. They want to move around, they want exposure to different skill sets. So we want to be really flexible in the way we cross-train and offer them exposure. That’s different from the way we thought about restaurants 15 years ago. JC: I’m very hopeful. I hope more restaurants open. I hope we’re faced with constantly having to reach outside what we think the labor market is. Because it makes us better managers and it makes the restaurants more interesting. In the end it will prove that hospitality can have the kind of impact on our culture that we believe it can if we can reach a wider audience of people who want to practice it.